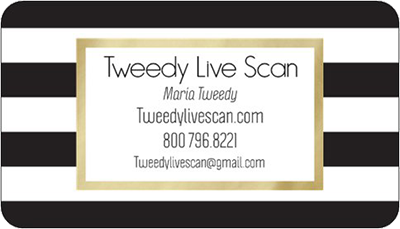 Tweedy Live Scan provides ink card fingerprinting in California. For a free estimate, call us today. The mobile live scan service allows the Department of Justice to quickly check fingerprints against known criminal history records, and then the results are sent back to the organization which requested the live scan service. The results return within 2-3 days, although occasionally up to two weeks may be needed to process a request. Many police departments no longer provide this service to the public. We are one of the few agencies providing this service. Reducing errors and minimizing the chance of your prints being rejected by the FBI.FBI Ink cards can only be used for out of State Licensing or for direct submission to the FBI. For In-State Licensing Fingerprints must be submitted to the Department of Justice Electronically by the Live Scan Fingerprint Submission. Our technicians are trained and certified by the Department of Justice. You can rest assured that you’ll receive the highest quality work and best possible results when dealing.